Owned by the Spanish hospitality giant, Melia Hotels International, Paradisus Resorts is a renowned luxury all-inclusive resort brand. With numerous locations and a well-established brand, Paradisus was looking for a cohesive music solution that will provide a consistent, overarching branded sound experience starting immediately upon guest arrival. With this intent, they approached Roundhouse to develop 360° Music Architecture™ for their luxury property located in Playa del Carmen, Mexico. Even though they had a background music system in place, there wasn’t any consistency or relevancy felt from it. Music was repeating several times per day, negatively affecting the guest experience and reducing staff morale and performance. There was absolutely no differentiation of music (by tempo, feel, genre) for various times of day (morning, afternoon, evening, night), and thus, the whole experience often felt monotone and worn, like one big long song. We made several trips to the property, not only to assess the reported issues firsthand but also to better understand the overall environment, get a feel for the ambiance, speak with the staff and study the guest demographics and habits. This allowed us to work with the Guest Experience Manager and the Corporate Brand Standards Director much more effectively, which ultimately resulted in us developing a distinct branded Paradisus sound, experienced immediately upon arrival. We curated specific playlists according to the time of day and special playlists for each of the music areas respectively (Lobby, Restaurants, Pools, etc). Furthermore, each of those areas received 7 unique playlists (one for each day of the average stay in the resort), making sure that guests would not experience the same playlists repeating over and over again. Each of those playlists is updated every month, for further variety and freshness. Using our proprietary Core Music Architecture server, we were able to automate when the implemented Music Architecture starts and stops, change playlists between times of day, adjust volumes according to times of day and much more. Onsite staff was provided with training in order to ensure all of the audio hardware & software is always functioning properly, in order to ensure maximum guest experience at all times. In the end, adding the “360°” aspect to the developed Music Architecture, we’ve made it possible for the guest to bring the beloved Paradisus music experiences home with them, in the form of a lightweight branded radio app – “Pure Freedom Radio”. The app allowed the guest to access Paradisus branded sound 24/7 and listen to it in their cars, at work, at home, while exercising etc. This allows the guest to develop a stronger connection to the memories experienced during their stay at Paradisus. The app also allows Paradisus to continue to communicate to the guest via targeted promotional advertisements/promos, easily reaching their audience using a platform where they have no competition. Immediately, we received confirmation that staff performance and morale is greatly improved, which had a direct impact on the Guest Experience. With all important daily functions being automated and monitored by Roundhouse (playlists changes based on time of day, updates and volume adjustments), the staff no longer needed to manage music and could focus on their actual hotel related duties. Furthermore, a constant stream of guest complaints regarding repetitive music was eliminated which impacted overall trip advisory ratings. 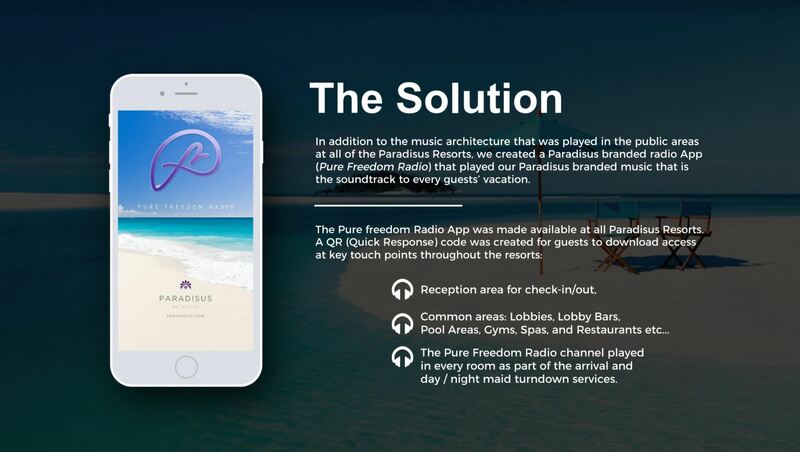 Numerous guest requests to find out which music & playlists are being played have been redirected to the Pure Freedom Radio app which currently boasts a monthly listenership of well over 10,000 listeners, allowing the Paradisus Resorts brand to communicate with them on daily basis, greatly assisting with driving loyalty and repeat sales. Due to the success of this pilot project, Roundhouse is now Melia Hotels International Preferred Music Partner for all of the Americas (United States, Caribbean, Mexico and South America), providing our Music Architecture Services for all of the Paradisus properties as well as the Melia and Innside brands.